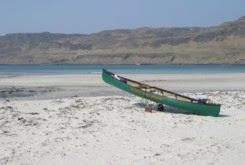 Our plan was to paddle around the west coast of Mull, stopping on remote beaches and camping under the stars. However, like most trips things didn't go quite to plan.The weather forecast had looked really bad before we left home so we were pleasantly surprised when we reached the ferry in Oban in the beautiful sunshine with calm seas in front of us. After paying the £60 for a return ticket to Mull, we stood on the deck of the Caledonian ferry looking out over the water, when it suddenly dawned on us for the first time, just how tiny our canoe really was and how far we had crazily planned to paddle.For our first night we had pre-booked a small guesthouse called Barn Cottage in Gruiline, only £19 a night B&B. It was surrounded by woodland and only a mile away from Loch Na Keal where we'd planned to launch our canoe and start our adventure the following day. Mrs Babbington who ran the guesthouse was great. She offered to take us and the boat down to the loch in her landrover and even said we could leave our car in the safety of her grounds whilst we were off paddling. I thought that was so nice. The following morning we were up at 6.30am and having ordered a late breakfast we decided to explore a little of the island on foot. We walked towards Loch Na Keal along a leafy single-track lane where we heard woodpeckers hammering away and saw an agile sparrowhawk darting in and out of the hedge in front of us. The loch, which is about 6 miles long, soon came into view and so did or first problem. We were hoping for a beautiful calm millpond instead we found a spitting, bubbling cauldron of white spray and huge waves. A quick call to the coastguard and our fears were confirmed - force 5-6 winds increasing to force 7 in the open sea towards Ulva where we had hoped to spend the first night camping. 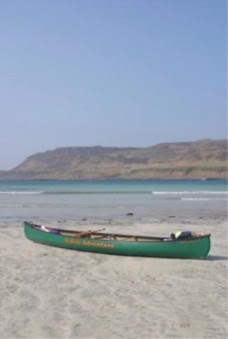 There's a number to call regarding camping on Ulva; they openly welcome you as long as you let them know you're coming. Slightly disheartened at being told the bad weather was due to last several days, we carried on our walk along the loch. However, it wasn't long before a black dot appeared through the clouds and all thoughts of canoeing disappeared. It was high above us but the shape, stubby tail, huge broad wings, was unmistakeable -our first Sea Eagle. It got closer and closer and soon we could see its pure white tail and huge talons as it lunged for something just out of view. Contrary to popular belief these birds are larger than the Golden Eagle, with wing spans of just under two and half meters. I still can't get over the sheer majestic nature and presence of these birds. With smiles on our faces we walked back to the guesthouse. Over breakfast (which was so huge it took over an hour to eat all the courses) we decided to forget camping and spend all our evenings warm and dry at the B&B and settle for canoe day trips instead.That afternoon and the following day we spent driving around the rest of the island doing the touristy bit, Tobermory and Iona and getting just the briefest view of a Golden Eagle above Glen Mor. Thankfully on the third day there was a break in the weather and we headed off for Loch Scridain. What a magnificent location with Ben Mor towering 966 meters above us and 8 miles of slightly choppy water to explore. 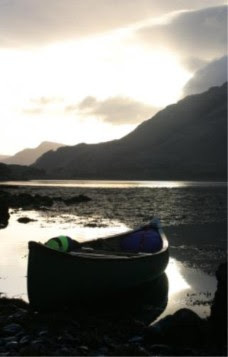 With our packed lunch and flask secured nicely in the canoe we left dry land for a full day on the water. The first part of the loch near Pennyghael is a series of tiny islands, which acted like a maze when we tried to navigate our way through them. Around this area the water does drop considerably when the tide goes out so its well worth checking tide tables first to make the most of it. It is said that Loch Scridain was carved out of the mountains by the devil who, when having an argument with someone on top of Ben Mor, was defeated and was pushed over the edge of the cliff. As he bounced down the hillside, ledges appeared where he fell, and his final fall at the base of the mountain caused such a cleft that the sea rushed in, thereby creating the loch. He must have been a huge devil! As we paddled along we realised this place is a birdwatchers paradise. There was everything from guillemots to hen harriers, something different everywhere we looked. Then, in the distance, I noticed what looked like a plastic grocery bag floating in the water. I grabbed the binoculars and to my amazement saw, coming straight towards the boat, a little Auk (no not the lord of the rings type, now that would have been an interesting tale to tell) but a tiny black and white penguin- looking thing. You should have seen me desperately trying to catch hubby's attention whilst trying not to startle the little thing. Eventually a subtle nudge with my paddle did the trick and we sat in wonder as this amazing little bird bobbed past the boat so close I could have scooped him up in my hand. I'd only ever seen photo's of them in books before, so this was truly amazing. As we paddled back to shore, we got the feeling we were being followed. Looking back we saw 3 inquisitive young otters following the canoe. They came within about 8 foot of the boat and were fantastic to watch, as they rolled, dived and played in the water around us. I was hoping to see one of them do the oyster shell-breaking thing on their belly but I think they were way too busy working out what we were doing, for stuff like that. The following day we were up extremely early again and saw the sun rise as we walked towards Loch Ba about 30 minutes from the B&B. I would have liked to have paddled this loch but the landowner was a keen fisherman and I'd heard he didn't really like people using his land to launch boats so we decided to leave it. It was worth the walk there though as I saw a barn owl, a tawny owl, a herd of deer including an albino calf and a huge stag. I even spotted 2 sea eagles (might have been the same one twice though) all in a matter of minutes.After breakfast we drove up to Calgary Bay towards the north of the island. This has to be one of the most beautiful places in Scotland. With its golden sands and turquoise waters it could easily be mistaken for the Caribbean; well, apart from the temperature and the odd highland cow that is. Feeling Lazy, I decided to use my newly acquired canoe wheels to portage down to the water's edge. Is it me or do these wheels have a mind of their own? In the shop it sounded so simple, the instructions were straightforward but the actual doing it was impossible. I tied the canoe on as the diagram showed and for a few yards it was great but as soon as I hit a tiny bump the wheels twisted and I had to start all over again. It took ages to reach the water, which was only 200 yards from the car park. If anyone has any tips on using wheels over rough ground I'd love to hear them. Anyway, by the time we reached the water, the wind had started to pick up but the tide was coming in so we decided to risk it and launch the canoe. If fact I decided hubby should go out in the canoe and let me take some photographs of him surrounded by this stunning landscape. What a mistake! Within minutes I could see he was getting into difficulty. 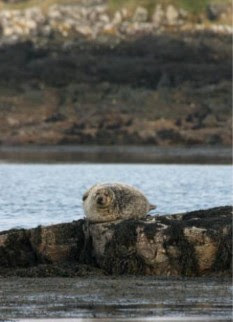 The wind was dragging him quickly out to sea so I started shouting and waving my arms to get him to come back to shore. Unfortunately, he thought I was shouting directions for the photographs and carried on paddling. Within 5 minutes he was a speck on the horizon. The wind was swirling and getting stronger and I was left on the beach totally helpless. I watched him struggle and get so far in then the wind would pick up and he'd be even further out than before. We were well-equipped with buoyancy aids, airbags and flares in the boat but neither of us had the experience for anything like this. Part of me wanted to swim out to him as I know two of us in the boat would get to shore easily but I also knew the chances of being swept out to sea and missing the canoe was too big a risk to take. For 40 minutes he struggled to get to dry land then finally he made it. I saw him in the distance stumble out of the canoe and collapse on the beach. For 20 minutes he lay there before he found the energy to move. It kept running through my mind all those nights I'd sat home alone wishing he wasn't spending so much time at the gym, now was so thankful that he had. As I made my way along the beach to where he lay, a beautiful male peregrine falcon flew over head. I was about to shout out and tell hubby but somehow I know he wouldn't have cared. After a long lunch and a huge reality check in the safety of canoeing on the sea we decided to head off to Loch Spelve, a sheltered loch at the south east side of the island. It's only about 4 miles long and 2 miles wide with a small part taken up by fisheries, which is best avoided, but the rest of it is stunning. It was like a millpond and just what we needed. A grey seal came up and had a good sniff around the boat then two red throated divers came into view (the feathery sort). I was so engrossed in taking photographs of the incredible landscape and the wildlife that the sun had almost set by the time we reached the shore. 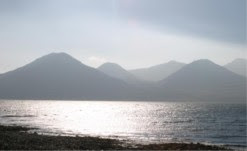 That evening, which was our last on the island, we spent sharing a bottle of wine on the banks of Loch Na Keal. I know we didn't do all the paddling we had planned but it was still a wonderful few days and it gives us a good excuse to return to the island and do it all again.